In anticipation of the IPPA annointing another tenderloin as "best in the state" next month, I decided to write up one the the previous top tenderloin award winners. 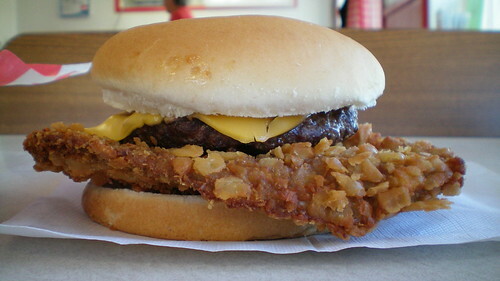 The Dairy Sweet was awarded the IPPA Best Tenderloin award in 2005. The plaques on the walls claim they sold six thousand sandwiches in 2006, and up to twelve thousand in any given year after that. A local real estate company recently listed the property with a note reading "owners looking to retire". This place was listed as "permanently closed" on google maps, but I called and they are still open. I would assume they are staying open at least until their regular winter break at the end of October. Location: 714 Iowa Ave. in Dunlap, Iowa (population 1,139) in Harrison County, Western Iowa. Its about 50 miles north of Council Bluffs. Directions: This place is a block west of the Lincoln Highway on the main street through town. Look for the sign. 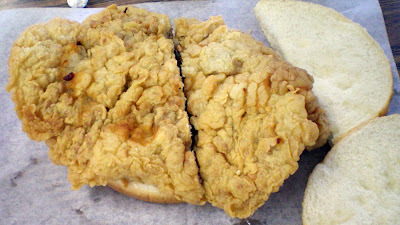 The Tenderloin: The first thing you notice is the thickness and the odd shape. 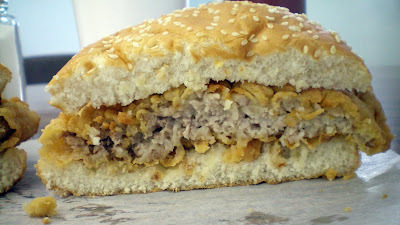 Its clearly beaten into a sort of thick and wavy loin shape with large bumps and curling parts sticking out. The bright white meat is consistently tender throughout. No two ever look the same. The fine breading here may have the most taste packed inside that I have found. There is just a ton of what tastes like seasoning salt and black pepper in every crunchy bite. I would put this one only behind The Augusta in Oxford among the tenderloins awarded by the IPPA. Overall 9.374 out of ten. Also on the menu: Its surprisingly big with a full ice-cream selection, burgers, fried stuff and taco salads. Service: Its counter service with a walk-up or drive-thru window on the side. It looked like three teenagers and one adult running the show when I visited. Ambiance: This is another small town ice-cream shop with small tables in a cramped interior and picnic seating outside. I think there were jigsaw puzzles hung on the walls inside. 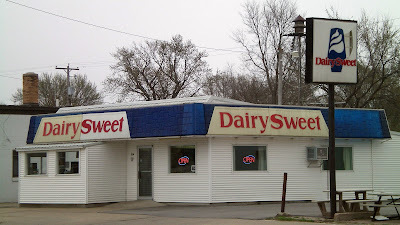 Final thoughts: Both of my visits to the Dairy Sweet have been special experiences while driving through the more scenic part of Western Iowa. Its really heartbreaking to see a place like this might be closing down, although I get the idea the owners are getting old and are ready to move on. Hopefully new owners can keep the tenderloin recipe intact. I really doubt any small town ice-cream shop ever suffers from a lack of business, especially over a hot summer. Whats up Tyrg, I love the site. I'm finally getting a chance to drive thru Iowa in the beginning of October. I'm going to South Dakota to do a little scenic riding. I've decided to take the route from Chicago into Sioux City, IA and staying there for a night and maybe do some exploring the next day. I have Tastee In and Out on my radar and will check out some other places but I'm curious if you got a spot for me to get a tenderloin at on my way to Sioux City from Chicago. Is there one that I have to stop for or even a couple within my route? I see Ill be going thru Des Moines and will check out your list here but thought maybe you might have a specific one I need to try. Thanks. They were out of business last summer when I stopped by. Still open different location 118 iowa ave just down the street! I left you a PM at the LTH forum. Does the fly on the sandwich come standard? I don't know how I missed that fly when I went through the pictures, he was persistant when I ate outside on one visit. Oh well, picture taken down. 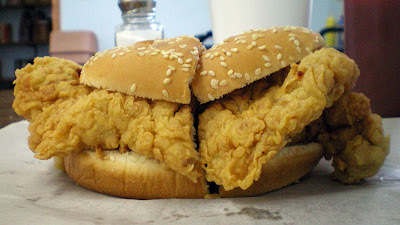 Now there are only 4 photos of this tenderloin worth keeping up. I actually thought it added charm - no joke! That's what the greasy spoon diners bring to the table...sometimes quite literally. Oh well - loving this blog! I am from Dunlap and yes they are looking to sell but they do plan on reopening once spring comes. It is easier to sell an open business then a closed one. Been to Dunlap several times as my grandparents are from there. 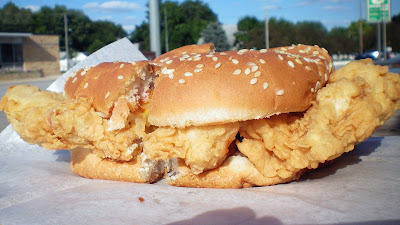 This tenderloin is delicious.